This recipe is super easy and tasty. Make a platter for a party or make a few for your child's snack. Mini kabobs look fancy and are fun to make—even little fingers can help assemble them! For a veggie version, substitute teriyaki-flavored baked tofu for the ham and cheese. Baked tofu can easily be sliced into small cubes and is very tasty with the pineapple. 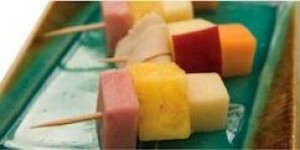 Using toothpicks, assemble the mini-kabobs in the following manner: 1 ham square, 1 pineapple chunk, 1 ham square, and 1 cheese cube. Repeat for each kabob. To make a vegetable version, substitute teriyaki-flavored baked tofu for the ham and cheese. Baked tofu can easily be sliced into small cubes and is very tasty with the pineapple. Refrigerate the kabobs for up to 3-4 hours before serving (they don't keep well longer than that).